What a great deal. Get The Boxcar Children Great Adventure 5-Book Set on sale for $17.47 (Retail $35.95). 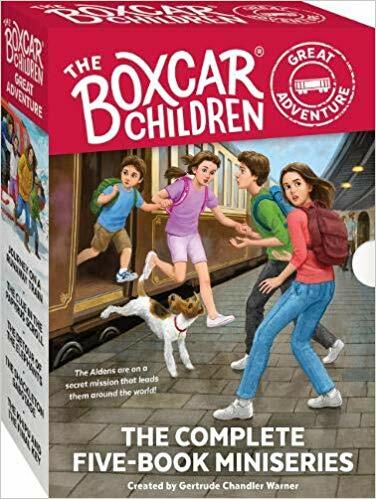 This boxed set includes all 5 paperback books from the brand-new, very special Boxcar Children Great Adventure miniseries. Launched to time with the 75th Anniversary of the beloved brand, this is the first new series to debut under The Boxcar Children name in nearly 20 years. After finding a ceramic turtle in an old trunk, Henry, Jessie, Violet, and Benny are introduced to the Reddimus Society, a secret guild whose mission is to return lost artifacts to the museums and historic sites they were taken from. They just need the Aldens’ help in delivering them, along with the turtle, to the first return point at Acoma Pueblo in New Mexico. The siblings ride an antique train across the country to deliver the treasures to the special agent in New Mexico, encountering enemies of Reddimus along the way. The trip is a success…but just as they are set to return home, there’s a last-minute change in plans. The kids must continue the mission—they’re headed around the world!